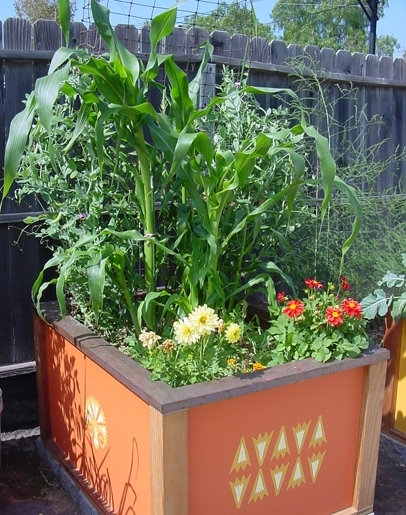 Corn, peas and dahlias in a raised bed garden. So you may have heard of ”farm to fork” or “farm to table”? Well, I like to think even more locally than that. I think in terms of “backyard to belly” . . . food so fresh you can eat it while standing in the garden without cooking it or with a little more effort, carrying a basket of fresh tomatoes, zucchini, peppers, eggplants, peaches, corn and beans into the kitchen to create wonderful meals for your family. I have a few tips on getting quality food from your harvest. So often we lose a lot of our homegrown produce because we don’t harvest at the right time. It is important to harvest at the peak of perfection - not before and not after. My worst food experiences from my garden have come from waiting too long to harvest. The corn gets starchy (and the corn earworms get more of the kernels than I do), the beans get tough, the melons, when overripe, are not even worth cutting open and peaches will not hold up well when they are cooked or canned. To be a good gardener and a good chef of ”backyard to belly” foods, you really have to stay on top of the harvest and not let it get ahead of you. I know that if you work full time, you just may not have the time to harvest when you need to, but if you don’t take the time, then you have pretty much wasted your time and garden resources. One thing that can help is to invest in a separate cold storage system, I call it my “fruit fridge” (just a used refrigerator in the garage), in which you can store your harvested produce until you can process it either by cooking, or for longer term storage canning, freezing or drying. Your regular household refrigerator will work just fine but often there is too much produce and you won’t have enough room. Refrigeration will help to keep the produce fresh longer and allow you a little more time to process. For example, I have too much corn ready at one time. Corn is best eaten within a few hours after harvest since the conversion to starch occurs quickly. While it would be fun to have a corn feed or share with all my neighbors, I really would like to store some for the winter. I harvest my corn so that it is just mature but not too mature. Typically, the ears will be filled with kernels and the tips of the silks will begin to dry out. The “milk” from the kernels should be clear and not white. After harvest, I quickly move the ears to the refrigerator since that slows the conversion rate of sugar to starch. When I have time within the next day or so, I will prep them for freezing. The sooner you can process the corn, the better the quality will be. Peaches are another crop that tends to be ready at one time. One thing I do is write the approximate harvest date in my calendar for the next year so I won’t schedule a vacation during the harvest period. Second, peaches are best harvested for longer term storage (canning, freezing and drying), when they are fully ripe but still firm. You can then leave them on the counter until they are at the stage you prefer them at for fresh eating. If you intend to can, freeze or dry the fruit, it is best to process them shortly after harvest. If you have to wait to process, then store them in your fruit fridge until you are ready, but you should do it within a few days. If you want more information on proper harvesting and storage of home garden vegetables and fruits, visit these pages on The California Garden Web and The California Backyard Orchard. If you are new to preserving foods, The National Center on Food Preservation has free guidelines for you. 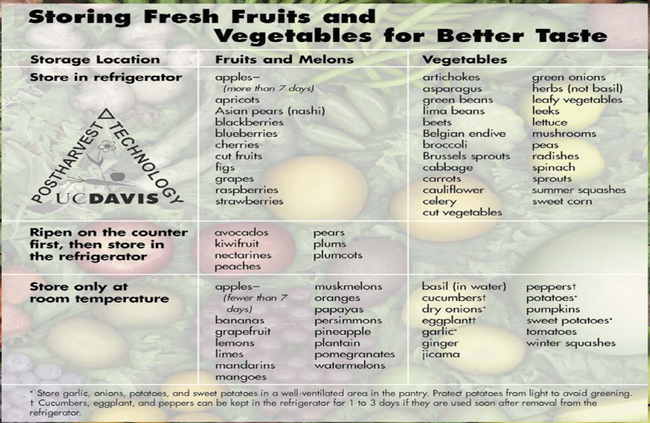 You may also want to visit the Postharvest Technology Center webpage for more information on storing fresh fruits and vegetables for better taste. catchy Pam! love the backyard to belly! I am searching for information on how to freeze fresh peaches.